Whether you've just bought your first home and there's room for a garden or you've recently discovered this fun hobby, you can take your first steps today to starting a home garden. Choose your location and start with a project you can complete comfortably within a reasonable amount of time. Nothing is worse than starting a home garden and not having the time to finish it or maintain it. Make sure the garden you start is one you'll look forward to maintaining and enjoying for years to come. Take these ten steps to starting a home garden. Choose the type of garden you'd like to start. Do you want to plant pretty flowers, spruce up a foundation planting, or grow a Victory Garden of vegetables, herbs and fruit? It's important to decide which garden you'd like to plant because each has different requirements for sunlight, the one factor you probably cannot change. You can adjust the soil or add water to a garden area, but it's often impossible to remove large trees, sheds or garages that block sunlight. Pick the location for the garden. Make sure the location you choose for your garden is one that's close enough to the house so you can enjoy it, both looking at it and spending time in it. It also helps to plant gardens near a water source, such as a faucet, or at least within reach of the garden hose. Determine the amount of light it gets. Gardeners define sunlight as full, partial shade (or sun), or full shade. Full sunlight is great for all kinds of gardens but especially necessary for vegetables, herbs and fruit. It's defined as six or more hours per day of bright, direct light. Partial shade or sun is three to six hours. You can grow many flowers in partial shade and some vegetables. Full shade is three hours of sunlight or less per day, and you can only grow some flowers in such areas. Test the soil. Take a soil sample to your local garden center and ask for a soil pH test and recommendations for amending the soil to get the pH within the range you need for the plants you'd like to grow. Add compost. All soils benefit from additional compost. If you don't have a compost bin, start one. All you need is an old trash can or a few wooden pallets nailed together to make a quick compost bin. Add kitchen scraps, grass clippings and leaves. Over time as the plants decompose, they will crumble into a black substance that looks like soil. That's compost. Add it to all your garden areas to feed the plants and nurture your soil. Select your plants. Most beginning gardeners find it easier to buy plants in pots or containers at the nursery or garden center than start plants from seeds. The exception are certain vegetables and flowers which grow best from seeds. Lettuce, radishes, beans, corn, cucumbers and melons, for example, grow best from seeds sown directly into the ground, while tomatoes, peppers, and eggplants grow best if purchased as sturdy, mature plants. Ask your local County Cooperative Extension office for help if you aren't sure. Dig the planting holes. Dig your planting holes twice as wide and deep as the pot the plant comes in. Add compost to the hole. Plant your flowers, vegetables, herbs or shrubs. Tip the pot over gently and tap the sides to remove the plant from its pot. Place it gently into the hole. Push soil around it and tap it down. Water your new plant. Give it a good drink of water. Spread Mulch. 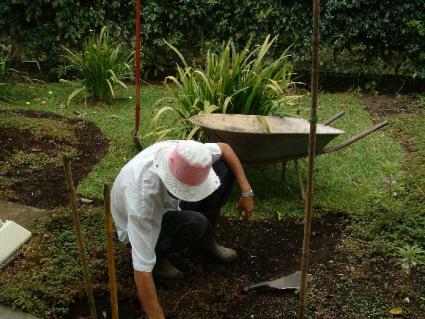 Add a layer of mulch to make the garden look pretty and prevent water and soil loss. The key to any successful garden is maintenance. Be sure to weed your new garden, either by hand or using a hoe or another cultivating tool. Water frequently to help your new plants become established and develop deep roots. Fertilize once a month with a balanced fertilizer or add more compost. Whatever you do, enjoy your garden, especially during the warmer weather. Before you know it, winter will return, and you'll long for that beautiful new garden you started in the spring.